This weekend, Ole Martin Dahle from Flatanger in Mid-Norway found what probably is an about 5000 years old Neolithic Era (Younger Stone Age) knife in the mountains. In the Nordic countries, the Neolithic Era lasted from about 4000-1800 BC. – Perhaps for more than 5000 years, not a single person has hold this knife, and it was I who did it! This is very special to think about, says Ole Martin Dahle to NRK Trøndelag. It was on a mountain trip with some friends that Ole Martin found the particular stone. Among with millions of other stones, he picked up this one. – I do not know why I picked up excactly this one, but it might have been the shape. It is very sharp on one side, and then I thought: Has nature really done this? When I got home and put it under light, then I saw the inscription. Ole Martin took a picture of the stone and posted it on the Facebook page “Norway nature,” and it did not take long before he got answer from an archaeologist. – The object you found is part of a beautiful slate knif from the Neolithic Age (about 5000 years old!). They are often called banana shaped slate knives because of their shape. The ornamentation of the knife is awesome! So this is a great find! This year’s archeology news from Flatanger? – It is found many slate objects from the Stone Age in Trøndelag and Møre, Mid-Norway, but it is special that this knife is found in the mountain, which makes this discovery unique, says Brevik. 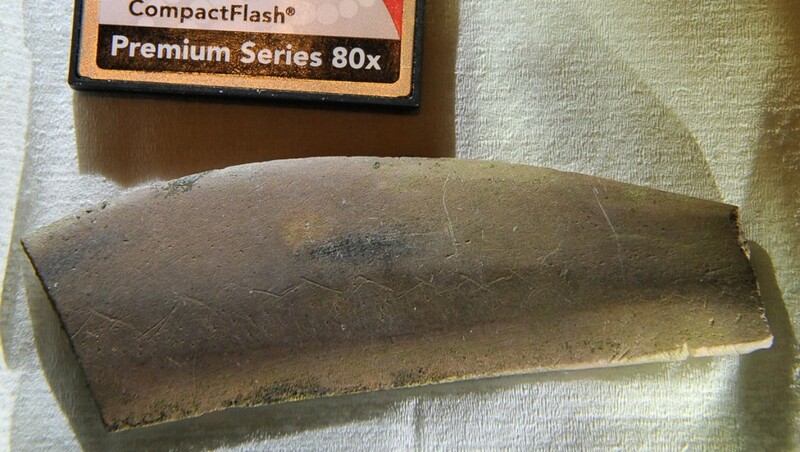 He is in no doubt that this is what is called an single edged Younger Stone Age knife.